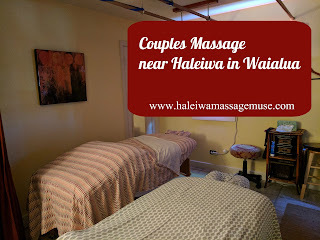 For those of you looking to celebrate a special occasion, we offer couples massage in our one-room clinic located in Waialua near Haleiwa. We partner with other therapists in the Ka'ala Healing Arts Center to offer this amazing side-by-side couples massage experience. Because we are a small practice, it is highly advised that you book your appointment well in advance. 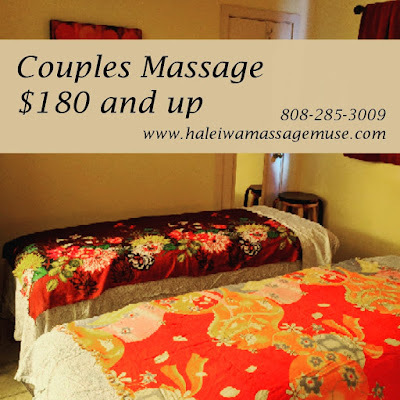 Our room is just big enough to accommodate two massage tables at the same time, and ashiatsu barefoot massage may not be possible when booking a couple's massage. For anyone coming with groups of two or more, we can also partner with other businesses in the Ka'ala Healing Arts Center and may be able to arrange your appointments at the same time in "tandem" with each other. Mix and match massage, skin care, rolfing, colon hydrotherapy, and more. Just let us know what you are interested in and we will help book your services. Read more about our couples massage and services for small groups.